It's a little known fact that I'm very-very-very-very-very distantly related to Count Dracula himself. Yeah! Straight up! George Michael is my fourth cousin twice removed. George also performed the song 'Faith'. And faith is precisely what this 45 minute documentary produced in 2004 is all about. Come on! Forget about vampire stories, folks. Because in this 'History Channel' special, the narrator, David Ross, chronicles the life and bloody methods of the real life Prince of Darkness, Vlad The Impaler. Now this feature is furnished with artistic depictions, re-enactments, as well as one on one pre-recorded interviews with specialists familiar with Vlad's pastimes. These include, Author: Mei Trow. The Historians: Tessa Dunlop, Dr. Aryeh Nusbacher, Bodgan Popovici, and John Florescu. Civil Engineer: Ed Mcann. Plus Conservationist: David Baxter, with a spokesman from the Dracula Society: Nicoloe Paduraru. Where was Vlad born: He was born in a Saxon citadel called Sighișoara, where he and his family lived, due to fact that his father, King Vlad II Dracul, bartered with the business-minded merchants that governed the area. What happened after his father died: With the need to survive and build upon his father's kingdom, Vlad and his kin travelled to Bran Castle and built upon his own defences there. 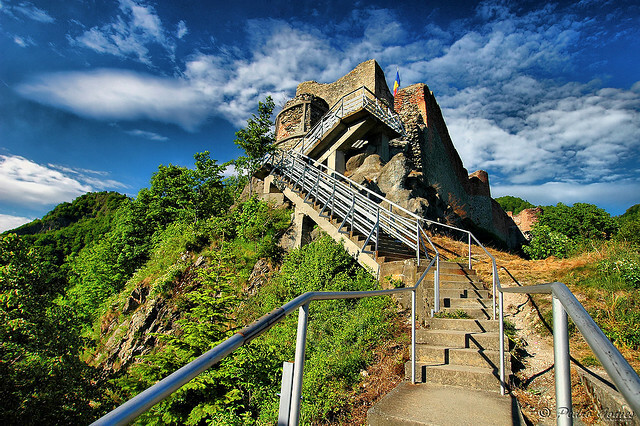 Then, once that was complete, he subsequently renovated Targoviste Castle, as well as his own extensive sanctuary nearby, called Poenari Castle. Was Vlad ever apprehensive of being killed: Yes.Yes he was. And that is why he had someone taste everything he put in his mouth. 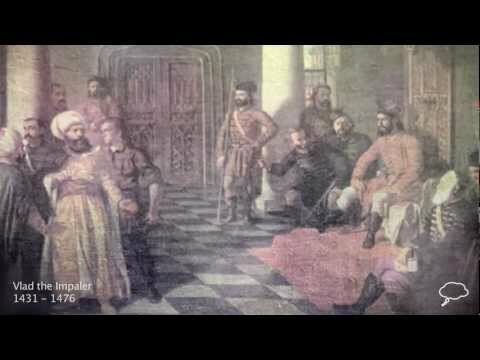 Who where the Boyars: They were the local political contingent who murdered his father, resulting in him tricking them, and then killing them in a grand massacre. Oh! So how did he kill his enemies: Vlad's favourite method of execution was to impale his enemies by inserting into them a huge wooden javelin. This method was generally slow in implementation, and entailed his victims to die over a period of days. Like a slow roasting shish kebab. Did he kill all of his enemies in this manner: No. Not really. Some were killed very quickly. Others had their noses chopped off as a token. And the rest were conscripted in building his Castles for him. How did his own people perceive him? Generally speaking, the majority of them thought he was their saviour, because he brought wealth and prosperity to their land. Did Vlad have any other enemy's? Yeah. Two as a matter of fact. The first were the Saxon merchants that once battered with his father: Whom he had obliterated under the cover of darkness. And the second were the Ottoman Empire: Whom he fought against over many-many years, leading him to stay cooped up in his castle for long periods of time, until he was able to escape to a Bucharest underground dwelling he built prior to this battle. Did he return? Ten years later it is believed he did return to take back his kingdom, but, for some reasons unknown, he allegedly died during the initial onslaught. Now my first introduction to 'Count Dracula' came from that number-crunching puppet seen on the prime-time kids-show, 'Sesame Street'. I'm sure you know of the character that I'm referring to, folk. One, Ha-Ha-Ha! Two, Ha-Ha-Ha! Tree, Ha-Ha-Ha! Excreta. Excreta. Excreta. Until I could do long-division in my sleep. But over time, when I began to learn about walking, talking, and generally thinking without the use of a number-crunching puppet, I started to realise that this grey-faced git wasn't 'Count Dracula' at all. No. It was either Bela Lugosi or Peter Cushing. Yeah. I'm not messing about. Whenever I saw these two actors on the old goggle box, part of me believed that they were actually going to leap out of the screen and drink my blood quicker than I could drink my milkshake. Also, when I had the honour of meeting Peter at a play he was performing at a nearby theatre -- well -- let's just say my parents never took me out very much after that... errr... particular event. 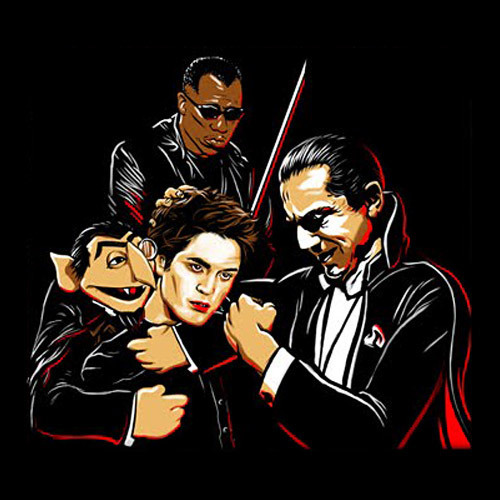 Of course by now I know who Dracula really is. He's my postman. No. Just kidding. He's Vladdy the impally. Here, if you don't believe me, check out the following facts for some proof on my knowledge in this blood soaked department. 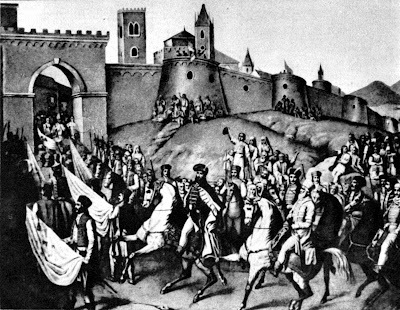 (1) The line of the Drăculeşti began on the very same day 'Vlad The Impaler' was born -- late 1431. 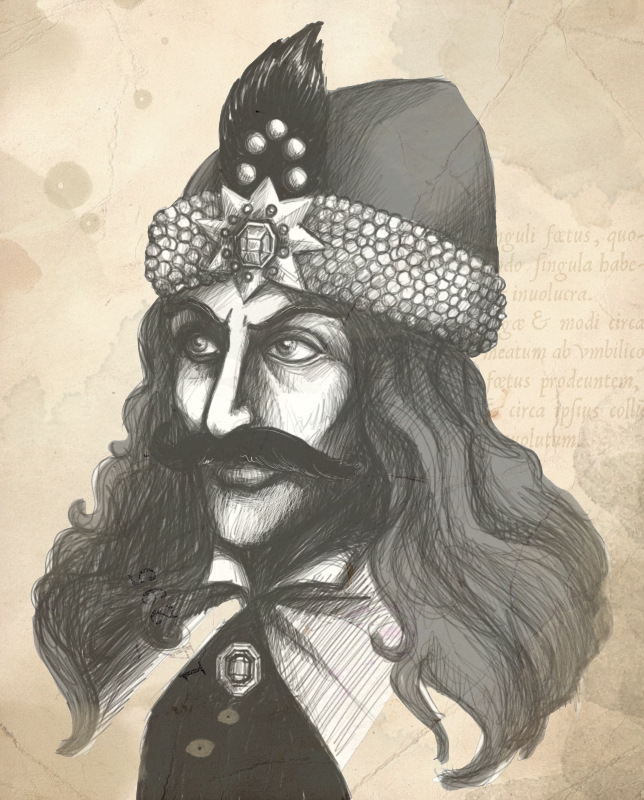 This was because his father, Vlad II Dracul, inherited the 'Dracul' part of his name when he joined the chivalric order called 'The Order of the Dragon'. Please note: It's a little known fact that 'Dracul' actually means 'Dragon' in Romanian, whilst 'Dracula' actually means 'Son of the Dragon' [not 'demon', as stated in this show]. (2) At one point or another Vlad's three other brothers would also rule Wallachia during their heretical reign [now called Romania]. However, whilst Mircea II and Vlad shared the same mother, Radu the Handsome and Vlad Calugarul didn't. (3) Vlad III was only given the title of 'Vlad the Impaler' posthumously after his death in 1476. Moreover, whenever he did write his name, it would always be in Latin -- 'Wladislaus Dragwlya, vaivoda partium Transalpinarum'. (4) Vlad was married twice in his life. His first wife was an unnamed Transylvanian woman that sired him one son: Mihnea cel Rau. Whilst his second wife was Ilona Szilagy that sired him two sons: Vlad Dracula, and the other one unknown. (5) After a genealogical examination in 2011, the present day Prince of Wales, Prince Charles, publicly stated that he is a distant descendant of Vlad III, via a lineage dating back to his 16th century ancestor, Ladislas Dracula. (6) The 'House of Drăculești' ended when the last Prince of Wallachia, Transylvania, and Moldavia -- known as 'Michael the Brave' -- was assassinated in 1601, after he won the 'Battle of Călugăreni' and the 'Battle of Şelimbăr'. OK, so now that I've got my history and the facts out of the way with, what did I think about 'History - The Real Dracula', huh? Well, in no uncertain terms I thought that this was a great program really. It managed to convey who Dracula was as a man, whilst doing it through his surroundings and his methods. In many ways it reminded me of another program I used to watch as a teen called 'Through the Keyhole'. Where Loyd Grossman would poke around a celebrity's house, dropping clues on 'who would live in a place like this?'. Granted, this documentary didn't exactly come across in this manner, as it did have a great variety of expert to explain on 'the who', 'the what', and 'the why'. Moreover, I did like the high level of enthusiasm each specialist had on this subject, as well as the pithy way Vlad's abodes were depicted as graphically enhanced images. On the flip side of this though, I would have liked for this show to explain more about Vlad's personal life (like I did), because in my eyes it did depict him as if he were a very nasty 15th century version of 'Microsoft'. Very capitalistic. Very single minded. And always trying to build better versions of something that have come out before. Alright, so maybe Dracula isn't one-hundred percent 'Microsoft'. He isn't plug-and-play for a start. Yet I did find something very nihilistic about him as a human being, which did remind me of a very-very-very blood thirsty businessman who's always on the go, and never wanting to compromise his own outlook on life. Don't you agree preselected YouTube clip? I think that was a 'yes'. Great show. But I'm afraid to say that it did not have enough bite to it. Ha!